How do you draw an ellipse on HTML5 canvas? First we start with an idea. For this character I chose to draw him on paper first. I wanted him to be very simple with few details (e.g. nose, mouth). Although I did not skimp on head size. The next step is to get our idea to pixels. In this case since I had a drawing, I scanned it in and outlined the drawing in Adobe Illustrator. I chose varying outline thickeness, thicker around the edges of body parts and thinner for the details. Also somehow during the process his head got even bigger. Next we color in the outlines. Keeping the design simple I chose one solid colors per body part, with an additional shade as a highlight color for added detail. Each part is saved as a seperate png image. We will be drawing parts on top of one another so we save each one with a transparent background. First we create a new object to hold our image references called images. Next we load each of our character parts via the loadImage function with the parameter corresponding to the part name (e.g. leftArm, legs, etc.). The loadImage function creates a new image object pointing to an image with the filename of the part name with the extension ".png" and in the folder "images". It also assigns an onload method to each image so when the image is loaded into memory it will caled the function resourceLoaded. We want to know when all of the images are loaded so we can begin drawing. We create a couple variables to track the image load process: totalResources and numResourcesLoaded. The resourceLoaded function increments the number of images that have been loaded. When all the images are ready we start a timer using setInterval that will call the redraw function 30 times a second. During the redraw process the canvas will be cleared and all parts will be redrawn. The order of that process is important. We first draw the the parts farthest away such as the left arm that will be covered up by our character's legs and torso. We need access to the HTML5 canvas context that we will draw on. For more information on how to access the canvas' context (and a workaround for IE) refer to HTML5 Canvas Example. 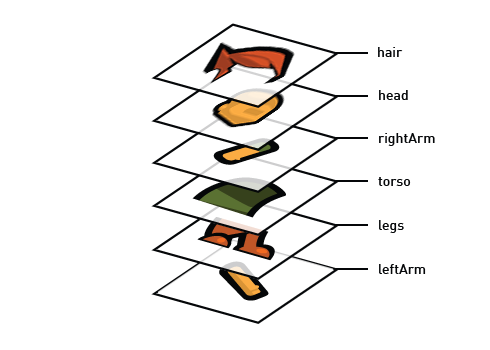 Layer by layer, each body part's image is positioned and then drawn on an HTML5 canvas. Before drawing anything we first clear the canvas using the weird assignment canvas.width = canvas.width. Then we draw each image using the context drawImage method specifying three parameters: the image reference, its x position, its y position. The image positions are relative to the canvas' top left hand corner. To add the eyes we are going to draw two ovals. We could have added the eyes to the eyes to the head image, but we want them to be dynamic to enable our first behavior: blinking. We call a drawEllipse function for each eye at the end of the redraw function. We want them on top of all the other body part images. The drawEllipse takes four parameters specifying the position and dimensions of the ellipse. For more information on the drawEllipse function see the brief: How to draw an ellipse on HTML5 Canvas. Our character matches our original digital version minus the shadow. We create the shadow with one oval at our characters feet. We want the shadow behind all the other image layers sp an ellipse is drawn at the beginning of the redraw function. Now we have on HTML5 canvas what we had with a drawing program. Remember, the HTML5 canvas is dynamic. Let's make use of that. The updateBreath function increases or decreases the breath amount. Once the breath reaches it maximum it changes the breath direction. Breath in, breath out. The purpose of this process is to update the variable breathAmt which we will use to represent the constant breathing of our character in the form of a subtle rise and fall of the head and arms. To breath life into our static pile of images, we turn to our redraw function. We the help or the variable breathAmt we vary the vertical position of certain body part images. We subtract the vertical location by value of the variable breathAmt for all the pieces we want to oscillate. The shadow will reflect this vertical motion in a change in width. The time has come for our first behavior of this series. After a given amount of time we will make our character blink. maxEyeHeight: Eye height when our character eyes are wide open. curEyeHeight: Current eye height while blinking. eyeOpenTime: Milliseconds since last blink. blinkUpdateTime: Milliseconds before updating blink status. blinkTimer: Calls the updateBlink function every blinkUpdateTime milliseconds. Every few moments we check to see if its time to blink. When the updateBlink function is called the eye open time is updated by increasing the variable eyeOpenTime. If the eye open time is greater than the timeBtwBlinks value we begin blinking by calling the blink function. The blink function will decrement the current eye height until reaching zero. When the eyes are closed we set the eye height to maximum and reset the eye open time. Here is a working example. The example code is available for download below. In Part 2 of the series will give our character the ability to jump.